Building Information Modelling (BIM) systems have the potential to revolutionise current practices in the construction industry and to automate the measurement of quantities from construction drawings. BIM is the process of generating and managing building data during its life cycle. Typically it uses three-dimensional, real time, dynamic building modelling software to increase productivity in building design and construction. The process produces the Building Information Model which encompasses building geometry, spatial relationships, geographic information, quantities and properties of building components. BIM allows for greater collaboration between disciplines and trades involved in the process in order to produce better buildings that are safer, healthier, environmentally more sustainable and economically more efficient with fewer errors, omissions and less waste. 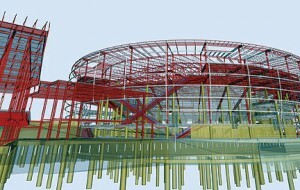 BIM is a major challenge to the construction industry as a whole. The adoption of BIM may redefine traditional professional boundaries in construction. Mulcahy McDonagh & Partners (MMP) recognises the important role that BIM will play in providing better buildings and better value for our clients. With this in mind MMP have invested in software such as Buildsoft BIM Reader. This new software integrates BIM to our existing Buildsoft software. The quantities can be extracted directly from a BIM model into Buildsoft or can be exported to MS Excel. Ability to influence the design from a financial perspective. The model will provide more accurate information earlier in the design process than the traditional method would allow. Ability to provide clash detection between various designs e.g. structural and mechanical designs and eliminate these errors before they become a problem on site. As part of MMP’s commitment to further education and training in the area of BIM we are currently a member of the Construction IT Alliance (CITA) participating in regular workshops on the topic. According to the 2009 SmartMarket Report, the vast majority of clients report seeing positive returns on their investment in BIM. Even more powerful than the productivity gains is the potential that BIM offers to help enable clients to design, visualise, simulate and analyse the key physical and functional characteristics of a project digitally before they build it. Using information within the model, everyone on the project team can make better, more informed decisions across the entire lifecycle of the building.